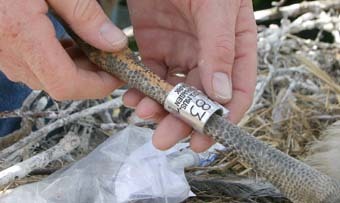 "Its not impossible that these birds will take up migrating. Not impossible at all. Only future can tell. Chances are, they might learn it from wild birds, and one thing is for sure. 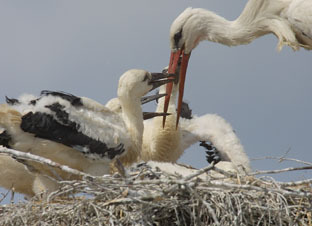 Its going to be exciting to watch"
The words of HS Denmark’s stork wizard number one, who in no way displays a "no can do" attitude towards this, the first breeding couple of White Storks (Ciconia ciconi) on the island of Zealand Denmark since 1965 - 39 years ! Many are not to happy about it. 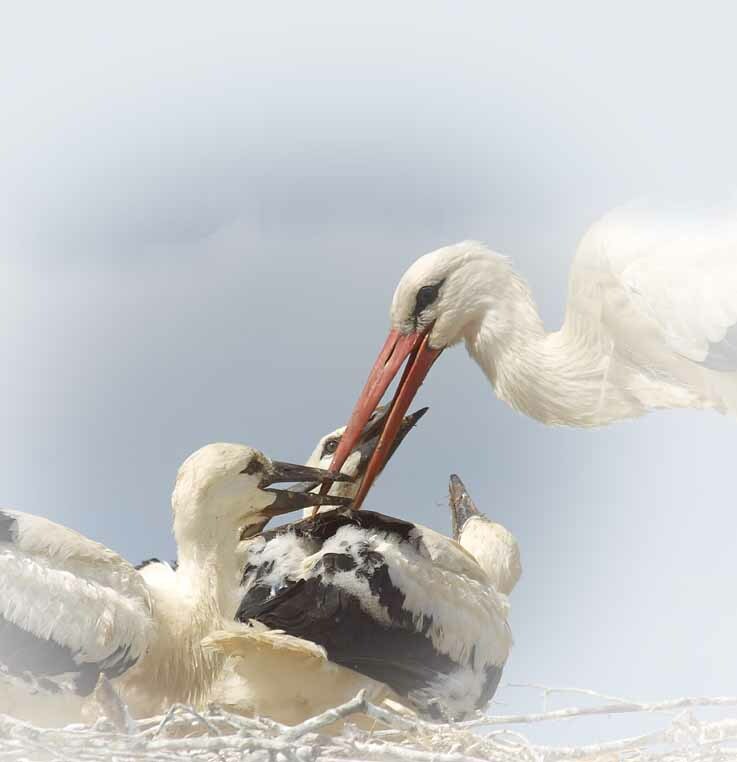 The parent-birds are out of one of the, not to popular, Swedish Stork-farms, which they left, as soon as they got the chance in October 2003. later to turn up at Hvedstrup, a small town on central Zealand, some 15 miles west of Copenhagen, to spend, wintertime 2003 2004 in a snowy and cold Denmark. Like so many other "Swedish storks"
The two of them having no idea what Egypt’s all about or which direction to go for Africa. Why should they care. On the farm in Hvedstrup the owner provides them with all the food they need. Ciconias are no big deal down south, in Spain or even in Germany and Poland, but to Denmark they are a problem. We are too civilised around here. Too civilised or at least thats what our countryside is. 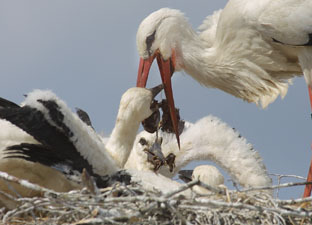 There are no food for White Storks, and accordingly there numbers have decreased and decreased over the years, until last years fatal, no birds breeding at all. HS is here to ring the four strong and healthy youngsters, who reacts in this situation, with fine wild-life instincts indeed. Showing that some wild life behavior is intact. They pretend to be dead. When HS, and the photographer, get near their nest they lie dead still, in the hope that "the approaching predators" will loose interest. So here we have future 1A83 – 1A84 – 1A85 and 1A86 completely anaesthetised during the operation of mounting their four rings. 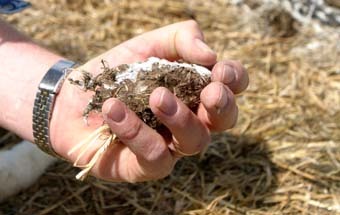 On this right hand picture HS shows a handfull of Stork pellet. And this is interesting. The sample evidently shows bits of insects, numerous black fragments of Beetle-shields telling that these Storks are not entirely depending on human help, but actually find some of their food themselves. This is a good sign. 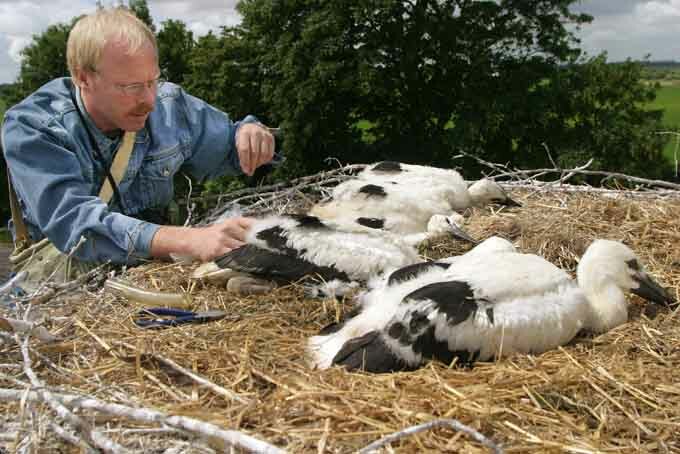 On a larger scale HS is currently involved in a project outmapping the food selection of the Danish White Storks. . This means going though, and analyzing 500 samples of pellet collected from 16 Danish nests over a period of time from 1976 up to 2003. 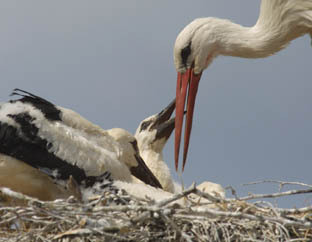 A job expected to answer questions, and hopefuly throw some light on the decline of the Danish storks. Afterwards. 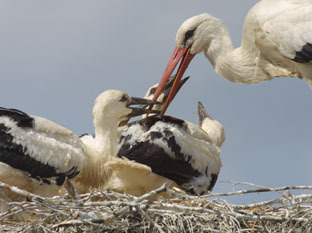 As soon as we left the nest they are up again and happily, tapping their bills on the newly arrived male bird, begging for food which the parent disgorges. A migrating succes in Hvedstrup. 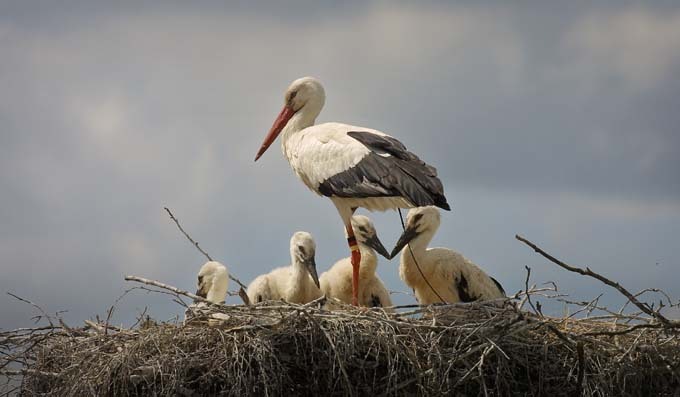 According to the owner of the farm the 4 young Storks disappeared from Hvedstrup early in the morning on Sunday October the 10th and have not been seen since then. Neither in Sweden nor in Denmark. 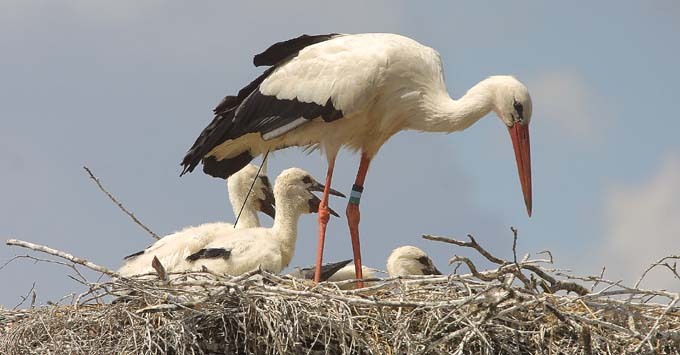 So it seams our 1A83, 1A84, 1A85 and 1A86, like the "real White Storks" have decided to take up migrating, crossed the Fehmarn Belt for good and have gone south to spend wintertime in a warmer climate.